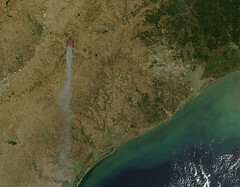 As many are aware, the State of Texas has had a bit of a wildfire scare in the past couple of weeks. In fact, the fires are still burning. As of this writing (fifteen days after the fire started) the major fire in Bastrop County is only Ninety-five percent contained (by the way, “contained” ain’t “put out”). And let me just get it out there off the bat: my house was never in any real danger. A small fire did start up within five miles of my neighborhood on September 4th (same day the Bastrop fire started), but it was under control within a couple of hours and no homes were lost. So this isn’t coming from someone who really suffered. This is just a guy, who for a few days, was quite concerned that his entire state might burn to the ground. Even in the post 9/11 world, we continue to go about our lives feeling pretty much invincible. We drive high-powered murder machines to work, jump on flying death traps to go see relatives, and climb aboard floating suicide booths just to get a little sun (and maybe a couple of margaritas). I see more tweets from friends and family during powerful thunderstorms than I do during the Super Bowl (but not as many as when Beyonce announced she was pregnant). There are tornadoes whirling directly over our heads, but instead of finding shelter…we’re logging on to Facebook. But who am I to judge? I’m the one reading the status updates and tweets during potential disasters. No matter what the danger, we always think it’ll happen to someone else. And most of the time, it does. A lot of people in Bastrop and around my state are seeing the world in a different, more dangerous light these days. And to be honest, so am I.
I know a guy who lost his house. He wasn’t a friend or even a close acquaintance, but I know him. I know someone who was deeply hurt by this tragedy. It always hits a little closer to home when you know someone who was affected. Last I heard, he’s been able to get help from his family and friends. I tried to see if he needed any additional help, but I was told he wanted everyone to donate what they could to other, less fortunate people who may not have the support of loved ones he has. The thought of that, quite frankly, leaves me breathless. Forget the 1,300 or so houses lost. People lost their lives. People lost their loved ones. People lost everything. There’s not much more to say after that. The wildfires across the state have taken a huge toll, not only in human suffering but they’ve left us with financial, agricultural, and environmental issues we’re not soon to overcome. Please do what you can to help. Donate to the Red Cross, or simply pray for those affected. And remember, it can happen to anyone, so be thankful for what you have.